MORE ALOHA FOR YOUR MONEY - OCEAN VIEW !!! Our spacious one bedroom condominium at the popular Kihei Akahi complex in South Maui is located on the 3rd floor of the C bldg, C309, with a nice ocean view. We have just added a new King Size bed and new bedroom furniture. Overlooking the blue Pacific waters at Kamaole Beach II, this gem of a unit has every amenity you can imagine for your stay in paradise. In addition to the King size bed, ,there is also queen sleeper sofa bed in the living area. The condo sleeps 4 comfortably. It has Air Conditioning and a ceiling fan in both the living area and in the bedroom. We have a full kitchen, and a washer/Dryer. Wireless Internet provided. We stayed in this condo two years ago and was impressed with the price and comforts of home that we decided to stay a second time. This condo is still the best value in Kihei. We enjoyed the ocean view from the lanai every morning and went boogie boarding and snorkeling at Kam II everyday. Snorkeling was amazing. We saw beautiful fish and turtles each time. The complex is well maintained and clean. We even used the outdoor grill by the pool and it looked brand new. We will definitely be back. This comfy condo is directly across from the best beach in Kihei. Very short walk to all the souvenir shops and restaurants you could want! Not the newest place but well equipped kitchen, linens and towels, and extras like beach chairs and snorkel gear. A very good value in a super convenient location. I stayed at this lovely condo for 9 days with my sister. We enjoyed the view from the lanai and the easy access to the beach. It was fun to make the trek nightly from the condo to watch the beautiful sunsets. The condo is in a great location to visit other places on the island. There is nothing we would change! It is well located, and a great deal for the money on the island. It is also only 1 mile from beautiful Wailea with its first class golf courses and a huge shopping Mall 'The Shops at Wailea'. You will want for nothing. All of the places to go are at your fingertips, but if it’s peace and serenity your looking for, have a quiet drink on the lanai, smell the Plumeria and relax the night away. Honeymooners’, families, singles, couples.....anyone who has an eye for value and a quest for a memorable Hawaiian vacation will love this condo. Kevin & Gayla Conway We have been married for 33 years and have 2 grown children, and the sweetest little 4year old 4 month old granddaughters. Since first visiting Maui on our honeymoon, Maui has been our true love. We visit as often as we can. We had stayed in the Kihei Akahi 3 times before we purchased there. We loved the location. When the opportunity came up we purchased a condo there. 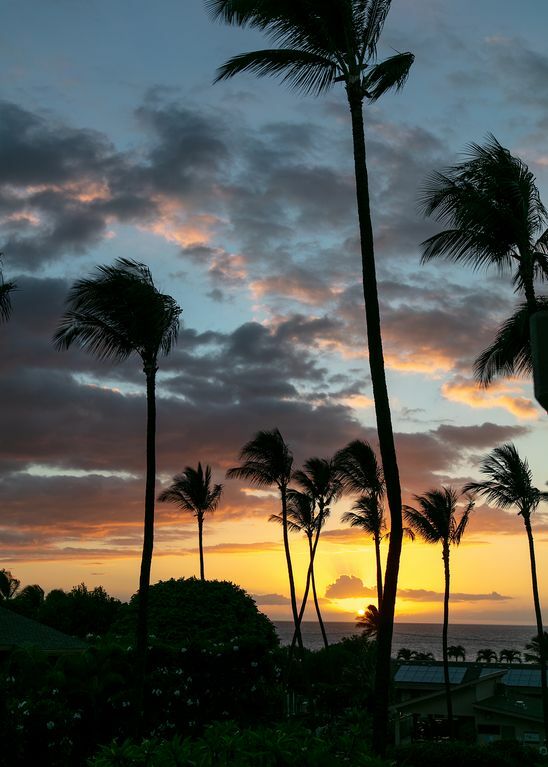 We have always enjoyed staying in our Maui home and are very happy to share our home with our guests. The very best benefit of our condo is location, location, location. We are across the street from one of the best beaches in Kihei, Kamaole Beach II. We are walking distance from several gift shops, clothing stores, an Ice Cream Parlour, video store, and restaurants. We are also only 1 mile from Wailea, where you will find the very large outdoor Mall of The Shops At Wailea. Our condo has a home-like tropical decor and nothing is more relaxing than sitting on the lanai with a Mai Tai gazing at the ocean view. EVERYTHING IS FURNISHED FOR YOU, Linens, Towels, Washer/Dryer including Laundry soap, Ironing board and Iron, Beach towels, beach mats, picnic cooler, & chairs, DVD/VCR & CD player, Board games for kids and adults, All you need to cook and serve with, including a microwave, toaster, coffee maker, and blender to make your own frozen tropical drinks. Our first impression of Gayla & Kevin’s condo at the Kihei Akahi was positive, as the unit was sparkling clean. And our experience over our week reinforced our good fortune to have chosen this condo! It was perfect for my husband & I! It has all the comforts of home - a fully stocked kitchen, good books to read, & beach supplies, including beach chairs, beach towels, noodles, & boogie boards! The Maui guidebook, Maui Revealed, was the best! The unit has a spacious feel. The building is well constructed. We hardly heard any sounds from our next door, above or below neighbours. The bedroom has a long mirrored closet with plenty of cupboard space, hangers, & room for clothes(& suitcases). There is also a dresser with lots of drawers for folded clothing. Most importantly, there is a comfy king bed with a great mattress topper. Even though I have joint pain, I had no problem with sleeping. The one issue, is noise from the elevator, which the bedroom is next to. As I wear ear plugs, I did not hear a thing, but my husband took himself off to the couch a couple of times, which he found quite comfortable. The toilet, bathtub & shower are in a separate room, so the bathroom area is functional. There is a decent amount of space for toiletries. The fabulous shower head gave one of the best showers I have ever had! The kitchen is very well equipped. No shortage of amenities with this condo rental!! There are numerous place settings, so you do not run out of dishes after one snack or meal, a plus! I was very pleased with kitchen supplies. There are several salad bowls, many utensils, including several spatulas! Not only are there paper towels and dish soap, but tin foil, plastic wrap & some spices. What a pleasant treat! And the dishwasher works well. There is an air conditioner available but we found the fans & the cross breeze kept us cool. Having a washer & dryer was a big plus, & laundry detergent & stain remover were provided. The living/dining room was both comfortable & functional. We enjoyed the large glass dining room table for 4 with comfy chairs. The flat screen TV gave us plenty of entertainment & the comfy couch provided hours of relaxation. We also appreciated the Hawaiian music CDs! A highlight of our mornings was coffee on the lanai with its table & chairs & a pretty view of the ocean. In the evening we could watch the sunset from there. We thoroughly enjoyed our stay. We have stayed in condos all around the world & this is one of the best. Mila, we are so happy you enjoyed your stay at our condo. We sincerely appreciate the the warm review. Although we don't have a problem of the noise outside the bedroom window during our 2 visits during each year, we do plan to install double pane windows when we can afford it, hoping that will help anyone that does experience an issue. Mahalo, and Aloha to you. Hope you come back to visit again. The property was perfect for our week long stay. My daughter and I shared the bedroom. There is a long mirrored closet with plenty of room and hangers for our clothes. Also a dresser for folded clothing. The bed was very comfortable. My daughters girlfriend slept on the pullout couch/bed in the living room and she said it was also quite comfortable. The three of us shared the 1 bathroom and it worked out well for us. The view from the lanai is of the garden, the walk from the 3rd floor to the beach across the street is only a couple of minutes. The beach is beautiful and we swam with the sea turtles and watched the beautiful sunsets. Their are restaurants, ice cream shops, gift and clothing shops all within walking distance. The kitchen is small but we only had a few breakfast items and fruit/snacks at the condo. We were generally only there in the morning and around bed time anyway because we were off on our excursions around the island most of the time. This convenient location was perfect for us! Had that smaller resort feel in the neighboring areas, was easy to find everything, beach was close as promised and the unit was clean, access was easy and fully equipped. It was more equipped than we thought, when the prior vacationer brought back even more beach supplies they forgot to leave behind after they left for their stay. Thanks so much Teresia. We are glad you enjoyed your stay at our condo. We are always striving to add to the amenities at our place. Good condo at a good price. Great view from the balcony. Washer and dryer big plus. The beach was awesome, from watching whales jumps out of the water, sea turtles actually petted a couple and then found out your not suppose too and great for walking. Plenty of stores and restaurants within walking distance. About 20 minutes to the road to Hana a must do. Thanks so much for the review. The beach, the view and convenience of the location we feel makes our condo stand out. Glad you enjoyed it. Overall, we had a positive experience in this condo and would recommend it for 1-2 people who have no issues sleeping on an uncomfortable bed and/or are not easily woken from sleep by elevator noises or people speaking. The sofa bed in the living room was pretty uncomfortable (a bit of an understatement) and made sleep difficult. The bedroom which has a comfortable bed is right next to the elevator so all conversations can be easily heard and folks can become very chatty while waiting for the elevator. This occurs at all hours and so uninterrupted sleep is not possible. Other than the sleep issues (which were a big deal for us on a vacation where we were hoping to catch up on sleep), the condo itself was fine and we found everything we needed. As others have noted before, the carpet is worn, the furniture and decorations a bit dated, but the price is reasonable and the location really great. We do agree the hide a bed is not as comfortable as a real bed which is why we will be replacing the mattress on our up coming trip a few weeks from now, although I don't believe there are very many comfortable hide a beds, but we will do our best to find one. We do understand that some light sleepers do have a problem with the elevator outside the condo, and we are sorry this guest did have a problem sleeping. In12 years there is many guests that do not have that problem. It truthfully can be just a percentage of the other guests in the condo complex being thoughtless and inconsiderate while waiting for the elevator, and on another stay the guest in our condo has no issues of noise. Home away from Home in Paradise! Great view at an amazing price. There were so many things to love about this delightful vacation condo at the Kihei Akahi! Communication with the owners was excellent. The photo of the view from the balcony is the real deal. We thoroughly enjoyed having our coffee out on the balcony each morning and discussing our plans for the day. Beautiful view of the ocean on one side and on clear days, a nice view upcountry on the other. A sweet little brown bird frequently visited to check out if we'd dropped any crumbs from our breakfast. Plumeria blossoms gently drifted down to the courtyard below in the light breeze. The proximity to the beach is one of the best features - it's less than 5 minutes until your toes hit the sand! We got up early each morning to enjoy a beach stroll and each evening we joined the people on Kam II for the nightly sunset countdown ritual. My husband went snorkeling on the point between Kam II & III and saw two turtles. You can tell that the owners have put a lot of thought into the needs of their guests. There are guidebooks for Maui and the guestbook is a treasure trove of useful tips from former guests. There is a good variety of kitchen utensils and the pantry cupboard has everything you need from a sewing kit to packing tape for those parcels to send home. The in-suite laundry facilities are very convenient. And the closet in the bedroom is chock full of beach equipment. We made good use of the snorkel gear, beach chairs, and the cooler. There were also boogie boards and sand castle-making toys for children. Some folks may find the kitchen cabinets a little dated and the carpet a little tired & worn but we were quite happy to forego the Better Homes & Gardens look in exchange for such an affordable price. The unit was clean. The decor had cute tropical touches and we felt very at home and comfortable. The condo is within easy walking distance of many shops and restaurants. I highly recommend the wonderful Hawaiian Moons Natural Foods store which is less than a 5 minute walk away. They stock many locally grown fruits & vegetables and their produce prices were better than the Foodland further up the road. We thoroughly enjoyed our week-long stay at this unit in the Kihei Akahi and we'd definitely consider staying here again if we ever return to beautiful Maui.